Hanoi (VNA) – The first Singapore cultural exchange festival will take place in Hanoi on March 23-24, according to Singaporean Ambassador to Vietnam Catherine Wong. 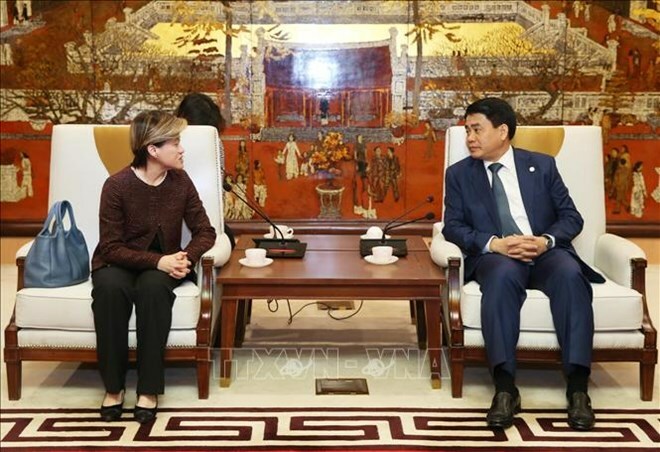 This will be a great opportunity for Singapore to promote its land and people to Vietnamese people, especially Hanoians, the diplomat said at a working session with Chairman of Hanoi People’s Committee Nguyen Duc Chung on February 26. Singapore will show off its special art performances and cuisine through the festival, she added. The festival has been held in many cities around the world such as London, New York, Moscow, and New Delhi, she said. Hanoi has become an important destination for Singaporean tourism and as such the country has selected the capital as a venue for the first-ever festival in Vietnam, she added. The ambassador congratulated Hanoi on its achievements gained over the past few years, especially in its selection as host venue of the second DPRK-US summit, taking place on February 27-28. She believed the event will be a success that will help promote the image of Hanoi and Vietnam on the international arena. Chairman Chung praised the initiative of hosting the first Singapore Festival in Hanoi and affirmed that the expansion of cultural exchanges between the two countries’ people is a big opportunity for Hanoians to better understand Singapore. The festival will also help promote the friendship and strategic partnership between Vietnam and Singapore, particularly the relations between Hanoi and Singapore, he said. He told the ambassador that Hanoi is building its e-government, joining the smart city network, and developing the green environment.